1. Title is what's getting you the Click! Okay, let's say you wrote an amazing article. So, what among that is gonna drive the readers to you? The content? The definitions/explanations you gave? The multimedia? NO, it's the TITLE that gets you the click. And with an unattractive and lame title, forget about getting user views but your own ones. The title should be brief and direct, but should be attractive and tempting, so that it pulls the viewer to your article. After getting the viewer, it's the lead or the introductory paragraph that will turn him from just being a viewer to a reader as well. The intro has many purposes and you can effectively fulfill them by writing an interesting one. Normally every viewer reads the intro part, but what's written there determines whether he would read the article further or not. It should be short but compelling. You should target the reader in a way to make him/her read the whole article. 3. Write informally, where possible! Unless of course if you are writing something that is defined to be formal, make your writing informal and casual. In this way, you can not only convey your message but can also address the reader in a friendly manner which is naturally easy to write and easy to read. Moreover, you cannot clearly express your opinions and thoughts if you’re going formal, so choose informal instead. 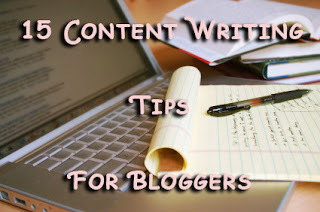 If you're specifically an online weblog writer, research is your key to an effective piece of writing. Instead of wasting your time on Facebook and Twitter (or whichever you use), try to research about the latest trends and advancements in your field of expertise (also your blog's niche maybe). I'm talking about general research and not the research you do for some specific post. This will help you in writing accurate and effective content and will also increase your knowledge of the subject. You cannot(or rather should not) just sit in front of your computer screen and keep on writing for like two hours and finish an article. The brain that you got needs rest. Take breaks quite often while writing so as to keep your brain open and fresh. This would make it focus more on the context and help you write better...much better. While writing, make damn sure that you feel relaxed and your mind is open and free of any stress. If you are angry, sad or feeling anything but normal, well do not write. Write when your brain is free of any pressures as that is when it would be able to focus the most and produce some good quality content. Also, you cannot clearly express your thoughts in the writing if you’re feeling stressed, so think about it. Never think that your reader has all the time in the world to read your stuff. Write in a focused manner and do not deviate from the subject. You might want to increase the word count by mentioning unnecessary examples, but hey - no one's got time for that. Write short but accurate and do not waste the reader's time in wondering what you wrote about. You might already know about the various SEO techniques that get you more users. Well, they definitely work. Try adding various keywords (which you can research on) that will make your article stand out among the others the search engine processing robot has to process. Add keywords in the title, intro and closing for maximum benefit of the trick. I could have mentioned this one under the previous heading but did not because this is somehow equally important and should be focused on individually, hence you find it here. What lame bloggers do is they put enough keywords to make their writing useless. Yes, keywords are important, but do not forget that it's also the humans who read your article. It should be human-friendly as well. Restrict keywords to title, intro and closing only and at the same time, produce an effective piece of writing so as to be at peace with both the viewers, the robots and the humans. Honesty is the best policy! Keep in mind that your article would be read by many across the globe and the day people figure out that you mislead them by writing something that's not right, you’re doomed. Write accurately and be honest in what you write. You would know the feeling one gets when he comes to know that all the hype that the writer created in the article was fake. Make sure you are never the writer in such a story. Writing the way you speak the language makes it easier. And yes, forget about the grammar and stuff unless if English is what you're writing on. Copying other's style is lame and at the same time difficult. You will need to put more effort on the style than the content. Like I mentioned before, you should write informally and in your own tone so as to deliver the message clearly. There are various angles you can cover the topic from, especially in technological reviews you can pick up one aspect of the subject and then get detailed into it. But, make sure the aspect you choose is unique and interesting. After choosing the angle, go detailed into it by staying focused on only that aspect. If you are writing about the form-factor of a smartphone, mentioning the pixel density is what's losing you the job. Increasing the word count means increasing the details you are providing. The depth should be directly related with the words you write. Writing 1000 words just to give a brief overview of a device is a fail attempt to write an effective content. Giving too much detail in a short post and giving very less detail in a large post are two things you MUST avoid. You should determine the depth you're going in, by the target word count. No one is such a genius to write an error-free document in the first run. There are certain mistakes that you figure out only when you're proofreading the document you wrote. Also, proofreading helps you in determining if you missed something out and then you can add that up. Never forget the quote by C. J. Cherryh, "It’s perfectly okay to write garbage – as long as you edit brilliantly". 15. Focus on the Outro too! Once you're done explaining what you needed to, write a proper closing paragraph which should either be directive or complimentary or both. This is in fact where you can interact with the user and give him/her your final thoughts and/or tell him what to do next. Make it a proper one since most of the readers jump directly from the intro to the end to see what you concluded there. If in case you can't dedicate enough time to write your own content and yet you want seo optimized written content on your blog then you can buy professional content writing services where a team of qualified authors can do the job for you at a fairly reasonable cost. I personally often hire content writers from Web.ThePensters and the writers there are credible and they know SEO well. Writing should be simple, informative and enjoyable to read. Another good point you described here is the point "1 Be honest". After trying hours, if I find something that is wrong, you can easily imagine my mind condition. Thanks for your advice. I am trying desperately to follow them, Even though I am tempted to dash off post after post, I must bear in mind what you have said here. One great and good attitude of professional writers is that they don't write under duress ( they write tutorials, articles, stories in a relaxed mood). This is very important because it means your total concentration and power of creativity is applied efficiently. But one of my favorites is #2, your first paragraph. So many bloggers lose me right there. I prefer the inverted pyramid strategy which is get to the point quickly then drill down to the points you want to make within the rest of your content. Start by asking a question, or giving a statistic or maybe quoting an interesting person. Whatever it is it should be something that keeps your reader interested. Long winder into paragraphs will lose 'em every time. me jab b koi post share karta he social network pr to share honay k sath us ki picture shere nahi hoti koi or pic share hoti he . or me nay bohat koshish ki ka is ko theak kar sako par nahi hoti . please koi hal bata day k me kesay is masalay ka hal karo.